For over a year, scientists have questioned the analysis of data points returned from Voyager 1 as it passed through a new and unique region on the outskirts of the solar system. On 25 August 2012, Voyager 1 registered an abrupt, durable change in the density of the energetic particles it was traveling. Initially, as reported by NASA on 4 December 2012, it was determined that this shift in particle density was the mark of Voyager 1’s full entrance into a new region of the heliopause, called the magnetic superhighway, at the outer-most edge solar system. 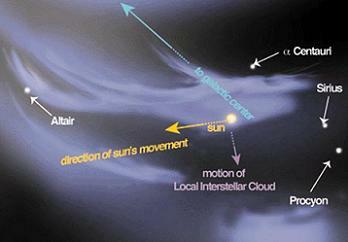 Thirteen months after the CME event, on 9 April 2013 (just over seven months after the August particle density change was recorded), the charged particles associated with the CME event reached Voyager 1 – which was at a distance of 17 hours 05 minutes 58 seconds light-travel time from Earth. The abrupt, durable change in the density of the energetic particles around Voyager 1 on 25 August 2012 was much more than the probe’s entrance into the magnetic superhighway. It was the date that Voyager crossed the boundary into a space where no probe had gone before: interstellar space. With this historic passage, Voyager 1’s mission in interstellar space stands to last at least 7 more years, as the probe has enough power to continue transmitting data about this unexplored region of space back to Earth until at least 2020. But equally as impressive as the uplifting and positive milestone we now understand Voyager 1 to have reached for humankind is the fact that the probe reached this mark with functioning scientific equipment – something no one truly envisioned happening in 1977 when Voyager 1 began what became its multifaceted mission. Voyager 1 was built to be a robust and sturdy spacecraft, one capable of surviving its encounters with the intense radiation and gravitational fields of the solar system’s giants: Jupiter and Saturn. But more importantly, Voyager 1 was built to be an instrument of science. Its large, 12ft antenna reflectors were the largest graphite epoxy antennae made for a spacecraft at the time of its launch. Three deployable booms carried most of the spacecraft’s scientific instruments, including the Ultraviolet Spectrometer, the Cosmic Ray experiment, the Plasma experiment, the Photopolarimeter, and the Low-Energy Charged Particle experiment. A second, longer boom carried a series of magnetometers and two whip antennae for the plasma radio experiment. Furthermore, all of Voyager 1’s experiments were designed to be compact, lightweight, and draw as little power as possible. During periods of interplanetary cruise and high-science data accumulation, data not immediately transmitted back to Earth was designed to be stored on a digital tape recorder with about 536 megabits capacity (about 67 megabytes), enough to hold roughly 100 images. But the truly remarkable aspect of Voyager 1, and the main element that enables the probe’s continued mission today, is its power source: three Radioisotope Thermoelectric Generators (RTGs) located on the third deployable boom. An impressive feat of engineering at the time, each of the three cylindrical RTGs on Voyager 1 were built with six layers of four 2-inch diameter plutonium (238) oxide encapsulated in a thin shell of iridium. These shells of iridium are in turn wrapped in graphite yarn and stacked in graphite cylinders. Each ball produced about 100 watts of thermal energy at launch, for 2,400 watts of thermal power from each RTG. However, like all spacecraft, the power source underwent changes and modifications in the development process. This led to the suggestion that the thermocouple legs be coated with silicon nitride to prevent sublimation of thermocouple material that was causing electrical shorts, which reduced power output. 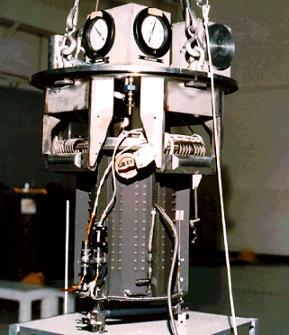 This careful engineering resulted in robust RTGs on Voyager 1 that have been in continuous operation for over 36 years, though they are only producing about 60% of their original output as of today due to the radiation- and temperature-induced degradation of the thermocouples. 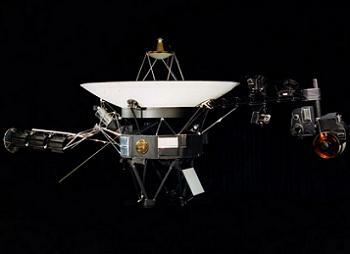 But even with the robust power source, none of Voyager 1’s instruments would have been able to return any data without the complex control of the probe’s six interlinked computers. 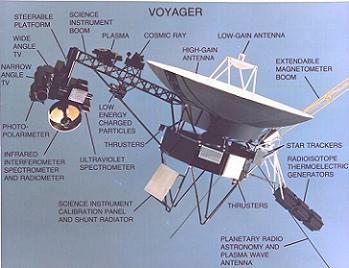 Voyager 1’s Computer Command System (CCS) was designed by engineers to control the sequences of activities to be carried out by the spacecraft; the Flight Data Subsystem (FDS) was designed to control the acquisition and downlink of data; and the Attitude and Articulation Control System (AACS) was designed to control the attitude of the spacecraft and orientation of the science scan platform. Additionally, the electronics of Voyager 1 had to be radiation-hardened to survive the probe’s planned encounter with Jupiter. With all of this forethought and complex engineering, the Voyager 1 spacecraft has been essentially remade since its launch as various systems issues forced mission controllers to improvise and the probe completed its primary mission in 1980. Upgrades to the indispensible Deep Space Network have also enabled continued communication and tracking with Voyager 1 at greater distances than were possible when the spacecraft was first launched. Voyager 1’s mission began on 5 September 1977 with its launch aboard Titan III-C rocket from the Cape Canaveral Air Force Station in Florida. Observations of the Jovian system began on 6 January 1979 and resulted in the discovery of Jupiter’s rings, a study of the intensity of the planet’s radiation belts, and the discovery of the existence of volcanic activity on Io. Study of the Jovian system for Voyager 1 concluded on 13 April 1979, at which point NASA realigned the probe for its encounter with Saturn in 1980. By this point, NASA had to decide whether to use Voyager a for a proximity flyby of Saturn’s moon Titan, and thereby eliminate the probe’s ability to continue on to the outer-most planet – at the time – Pluto, or to do a calculated flyby of Saturn to preserve the possible up-close study of Pluto. Ultimately, it was decided that Titan was of a greater scientific value than Pluto, and Voyager 1’s trajectory was altered for a close-up examination of this Saturnian moon. 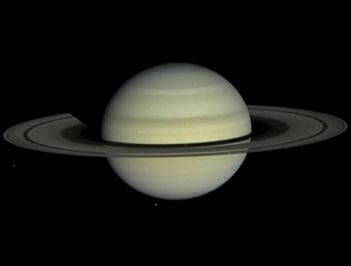 Observation of the Saturnian system began on 22 August 1980 and resulted in a close pass of Titan, which altered Voyager 1’s trajectory out of the ecliptic plane of the solar system in a “northerly” direction of travel. 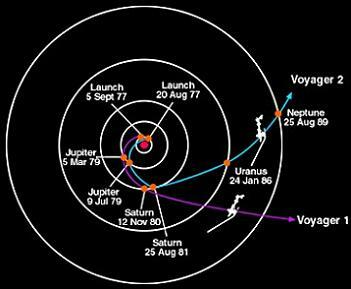 With the chance of any further planetary encounters nullified, Voyager 1 was repurposed for an extended mission to study the outer reaches of the solar system for as long as its instruments continued to function. On 14 February 1990, the probe’s cameras were turned back toward the solar system, and Voyager 1 took the instantly immortal family portrait of the solar system. 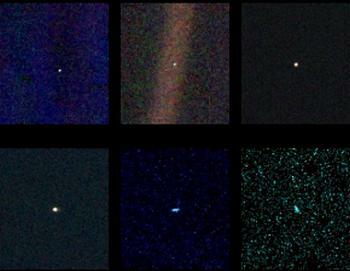 The family portrait was the first ever family photo of the solar system, and is the source of the famous “Pale Blue Dot” photograph of Earth – the farthest photo of Earth ever taken. The portrait is, in actuality, a composite image of 60 photographs obtained on 14 February 1990 from a distance of 6 billion kilometers from Earth at approximately 32-degrees above the ecliptic plane. The family portrait depicts six of the eight planets of the solar system along with the sun. Only Mercury and Mars were not visible due to proximity to the sun and scattered sunlight in the optics, respectively. Pluto, which is no longer considered one of the major planets, was not included in the photograph due to its distance from the sun and low light reflectivity. On 17 November 1998, Voyager 1 officially became the farthest human-made object in the solar system when it overtook the Pioneer 10 probe at a distance of 69.4 AU from the sun, a status it has maintained and will maintain for decades to come. With the probe’s longevity looking promising, NASA repurposed Voyager 1 yet again for the Voyager Interstellar Mission (VIM) – a mission to map the outer boundary of the solar system and explore the interstellar medium outside of the solar system. 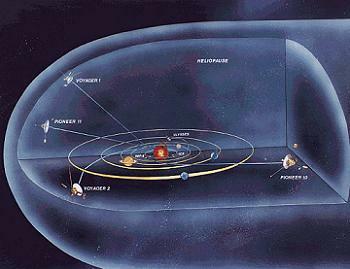 As part of the program, NASA tasked Voyager 1 with finding the termination shock (the moment when the sun’s solar wind suddenly drops from hypersonic speeds to subsonic speeds), mapping the heliosheath (a turbulent region beyond the termination shock where the solar wind is disturbed and acted upon by the force of the interstellar medium), and mapping the heliopause (the boundary between the solar system and interstellar space). 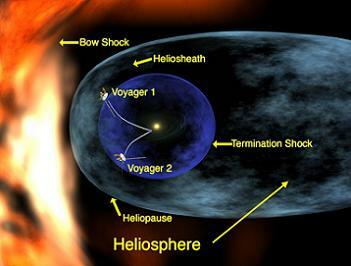 Voyager 1 crossed the termination shock in December 2004 and officially entered the heliosheath. 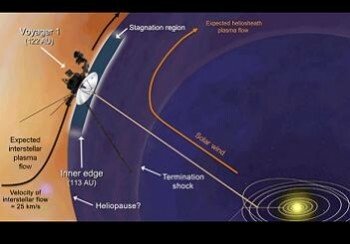 Six years later, scientists confirmed that Voyager 1 had reached the area where the sun’s solar wind is turned sideways by the interstellar medium pushing against the heliosphere – the sun’s direct area of influence. This area, called the heliopause, is the area with the solar wind drops to zero in relation to the outward push of the sun’s influence. Voyager 1 entered this area in June 2010. One year and two months after this announcement, Voyager 1, still functioning after 35 years in the harsh environment of space, crossed into the interstellar medium and became humanity’s first interstellar explorer. As of today, Voyager 1’s RTG power source continues to power the probe’s still-functioning instruments and is expected to do so until 2020-2030 – meaning Voyager 1’s exploration of interstellar space will occur, barring a collision with an unknown object, for at least 7 more years. (Images: NASA, NASA APOD, NASA JPL, L2, Caltech).